Today the Senate voted 60-39 to increase the federal debt limit from $12.4 trillion to $14.3 trillion. No one is happy that we need to borrow another $1.9 trillion in the next year or two, but the alternative–default–is unthinkable. So let’s hope that the House follows suit when it votes next week. As expected, today’s vote was entirely party line: 60 Democrats (including the two Independents who caucus with them) voted yea, while 39 Republicans voted nay; one R didn’t vote. You might be tempted to look at these results and try to read into them some larger ideas about fiscal politics. Perhaps Democrats all voted to increase the debt limit because they are big spenders? Perhaps Republicans will recklessly risk default in their anti-government zeal? I will leave to you, dear reader, to decide whether such claims have any merit. But please understand that the debt limit vote tells us absolutely nothing about them. With rare exceptions, votes to increase the debt limit do not involve any real substance. Defaulting remains unthinkable, so the debt limit has to go up. The horse-trading before the final vote may have plenty of substance–this round included a welcome amendment bringing back statutory PAYGO rules as well as an almost-successful effort to create a budget commission–but the final vote is pure politics. The Senate has to deliver a debt limit increase. And that means that the Senate majority has to deliver the votes. As a matter of politics, then, debt limit votes are a tax on the majority. The majority has to take the hit for increasing the limit, while the minority gets a free ride. To test this view, I looked at Senate votes on the last five stand-alone increases in the debt limit (three other increases were part of the housing, TARP, and stimulus bills that passed in 2008 and 2009). The chart above shows the fraction of senators in each party who voted to increase the limit. The results are striking: Back in 2004 and 2006, the Republicans (in red, but do I really need to say that?) controlled the Senate and thus bore the political tax of increasing the debt limit. In those two votes, the Rs accounted for 102 of 104 yeas. In 2009 and 2010, the situation was reversed, as the majority Democrats (yes, in blue) bore the political burden. In those two votes, the Ds (including the Is) accounted for 119 of 120 yeas. 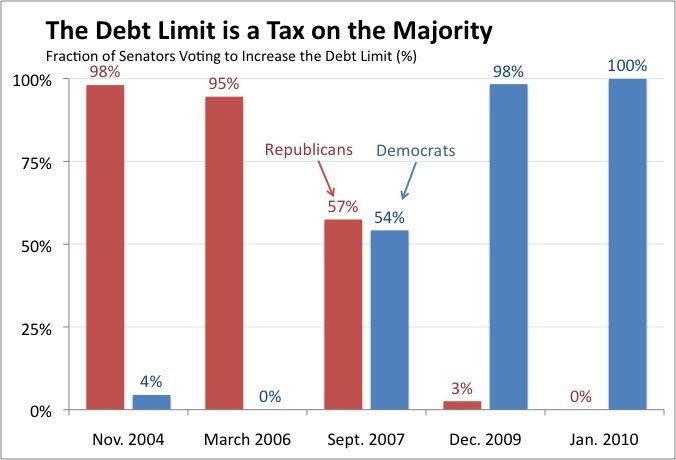 And then there’s 2007, when the two parties shared the burden of boosting the debt ceiling. What explains that rare outburst of bipartisanship? Divided government. In 2007, President Bush had to work with a Democratic Congress to get the debt limit passed. With divided government, the pain had to be shared. In the other four years, however, the President was the same party as the Senate majority. Bottom line: Sometimes it hurts to be in charge. For a good summary of past debt limit increases, see this CRS report. For information on Senate votes, start here. Wondering who the three aisle-crossers were? In 2004, Democrats John Breaux and Zell Miller voted yea. In 2009, Republican George Voinovich voted yea. Amongst its usual cracker jack budget projections yesterday, the Congressional Budget Office provided a few toy surprises for budget watchers. One is an updated estimate of the direct budget costs of the 2009 stimulus bill, officially known as the American Recovery and Reinvestment Act (ARRA). CBO originally estimated that ARRA would cost $787 billion from 2009 through 2019. Its new estimate is $862 billion, about $75 billion higher. 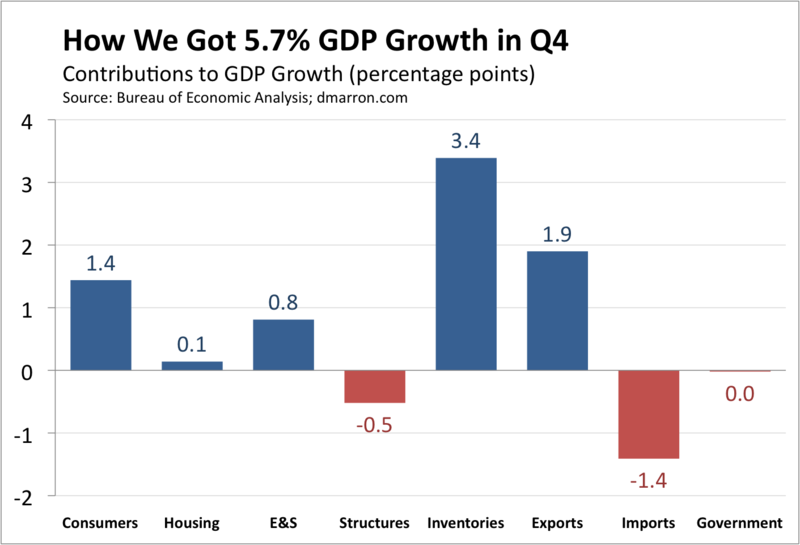 For an earlier discussion of the stimulus being bigger than expected, see this post. For a discussion of why the $862 billion figure (formerly known as the $787 billion figure) is not really the right measure of stimulus, see this post. Note: CBO provides many details about ARRA in Appendix A of yesterday’s report. Today the Congressional Budget Office released its much-anticipated projections for the budget. As usual, the headline figure is CBO’s estimate of the budget deficit, now projected to be $1.35 trillion for the fiscal year, about 9.2% of GDP. That’s slightly better than last year–when $1.4 trillion deficits amounted to 9.9% of GDP–but is still the second-worst since World War II. And, as CBO notes, new legislation could easily lift the 2010 figure higher. For example, Congress will likely consider further extensions to unemployment benefits and more war spending, not to mention a possible jobs bill. 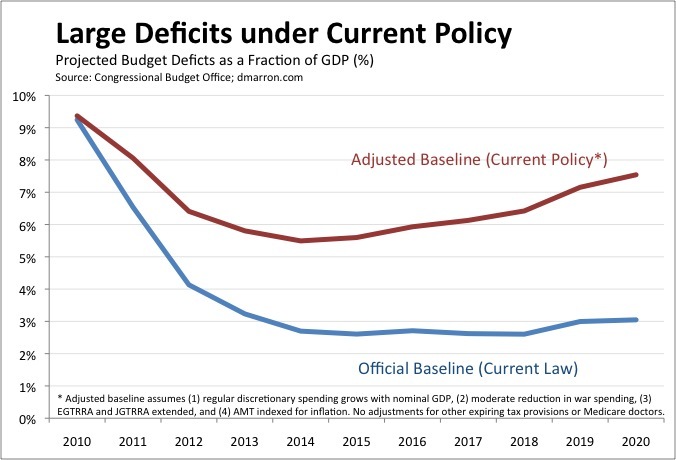 The blue line shows CBO’s official budget baseline. That baseline shows persistent deficits over the next decade. 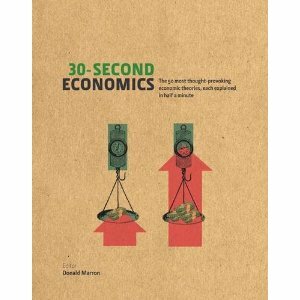 They fall below 3% of GDP by 2014 and then increase somewhat in later years. I would characterize that trajectory as unwelcome but not a crisis. It’s also completely unrealistic given Washington’s current policy predilections. Under current tax law, a remarkable number of tax reductions will expire in the near future. These include the 2001 and 2003 tax cuts (EGTRRA and JGTRRA, often known as the Bush tax cuts), the annual patch to the dreaded alternative minimum tax (which prevent the AMT from hitting more and more families), the Making Work Pay tax credit (enacted as part of the stimulus), expanded net operating loss carrybacks (enacted as part of another, smaller stimulus bill in the summer), and a panoply of other, smaller provisions (e.g., the research and experimentation tax credit). It is unthinkable that Washington will allow all these to expire. In recent years, discretionary spending has grown faster than inflation. As yet, there is no reason to believe that will stop. On the other hand, the current baseline assumes that spending on the wars in Afghanistan and Iraq will continue at their 2009 pace, adjusted for inflation, over the next decade. One hopes that assumption is unrealistically high. To help outside analysts construct alternative baselines that better show existing policy, rather than existing law, CBO provides estimates for several policy alternatives. Analysts differ on which of these alternatives they use to build a policy alternative (and, given more time, they may also use other estimates). As rough justice I made the following assumptions for the chart above: (1) that regular discretionary spending grows at the same pace as nominal GDP in coming years (closer to recent history than the baseline assumption of growth with inflation), (2) that spending on the wars in Iraq and Afghanistan moderates somewhat in coming years (CBO’s 60,000 troop scenario), (3) that the 2001 and 2003 tax cuts are permanently extended, and (4) that the AMT is indexed for inflation. Under these assumptions, the budget picture is much scarier: deficits never get lower than 5.5% of GDP and they are 7.5% by 2020. Bottom line: Current policy is unsustainable. Note: You should view my adjusted baseline as a quick-and-dirty, back-of-the-envelope of existing policy. For example, it doesn’t include any adjustments for other expiring tax provisions (which are substantial) or the infamous Medicare doctor payment problem; if you made adjustments for those, the deficit outlook would look worse. On the other hand, many political leaders, including President Obama, want to scale back the 2001 and 2003 tax cuts; if you did that, the deficit outlook would look better. Earlier today, Bill Gates released his second annual letter as co-chair of the Bill & Melinda Gates Foundation. The letter is well worth your time, particularly if you are interested in efforts to improve education and global health. There are five principles here: do things that others won’t do, think long-term, take risks, choose strong partners, and target eventual self-sufficiency. All are important, but the fifth deserves particular emphasis. The classic “fail” in development efforts is to finance upfront investments–building a school, for example–without giving thought to how beneficiaries will later manage it–e.g., how students will get books, who will teach, etc. To go for the “win”, Gates thus focuses on investments — creating new vaccines, developing new crop varieties, or inventing new teaching methods–that can be self-sustaining by beneficiaries (or their governments) once the upfront costs have been covered.